Hurray! Finally a delicious satisfying dessert that won’t make you feel guilty. So after visiting my Grandmas the other weekend I came back with some beautiful home grown rhubarb. I froze it to keep till later and this weekend was the time for crumble! However I faced a dilemma, I have been really really good with eating very healthy and trying to give up caffeine also! I didn’t want to spoil this so I thought I would come up with a healthier rhubarb crumble and skinny custard recipe to enjoy all throughout Autumn and Winter. 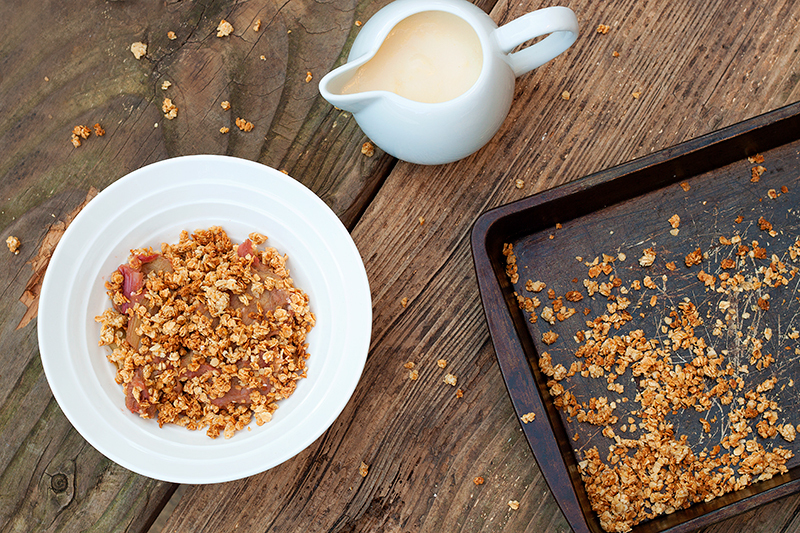 This pudding is super easy, all it is is stewed rhubarb and granola topping – clever spin on crumble! The skinny custard recipe is based on the healthy chefs recipe and I recommend her blog :). What other desserts would you like making healthier? In a bowl mix together the oats, honey, vanilla and oil. Spread the sticky oats on a baking tray and bake for 5 - 10 minutes. Checking every 3 minutes and stirring, making sure the all oats are turning a nice golden colour. Whilst the oats are baking, slice up the rhubarb into bite sized pieces and put in a non stick pan. Sprinkle over the sugar and cook on a low heat, stirring frequently, so the rhubarb softens. (Takes around 5 minutes). Once cooked place your rhubarb into a serving bowl and sprinkle over a generous helping of the honey baked oats. Quickly, lets make the custard and then you are ready to enjoy! Heat the milk, maple syrup and vanilla in a pan until almost boiling. Beat the eggs together with the cornflour in a separate bowl or jug and pour over the hot milk mixture.7. Whisk well and then pour the mixture back in to the pan and put back on the heat. Gently heat through until the mixture thickens. Pour the lovely custard back in to the separate bowl or jug and strain through a sieve to remove any lumps. 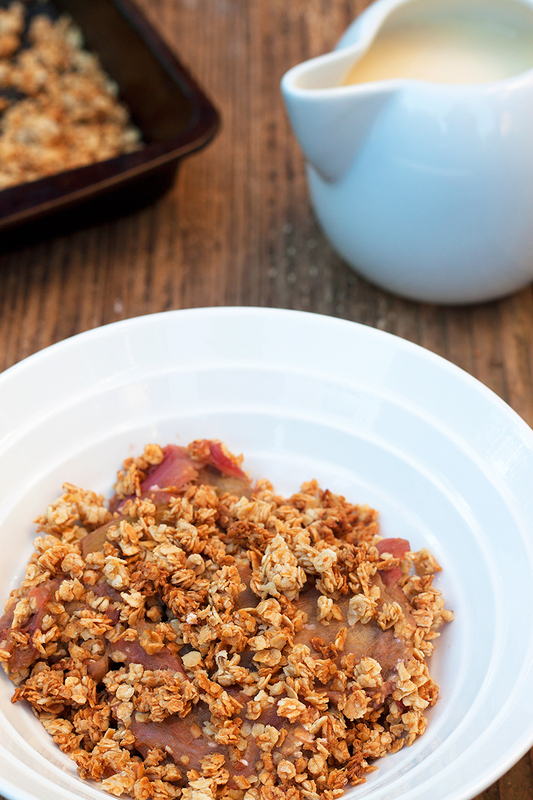 Pour it all over your healthier rhubarb crumble and enjoy. It was so good 🙂 Need to make it again!